As a few of you pointed out, there's no EXIF data here. Not terribly surprising, it's underwater (GPS signals don't work underwater). But there are a couple of clues. If you look at the lettering on my wetsuit, you can just barely make out "Stuart's Cove," which is the name of the place that rented me the wetsuit... AND organized the dive. which leads pretty quickly to their "Shark Adventure" page, which tells us that this is probably a Caribbean Reef Shark (Carcharhinus perezii). The second image in this set leads to the ReefQuest Centre for Shark Research page on identifying sharks in the Caribbean (Stuart's Cove is in the Bahamas), and on that page they have this lovely diagram with features describing the reef shark (snout short and blunt; pectoral fins moderately long and narrow; caudal fin margins dusky, etc.). If you check out that page, the features exactly match up. 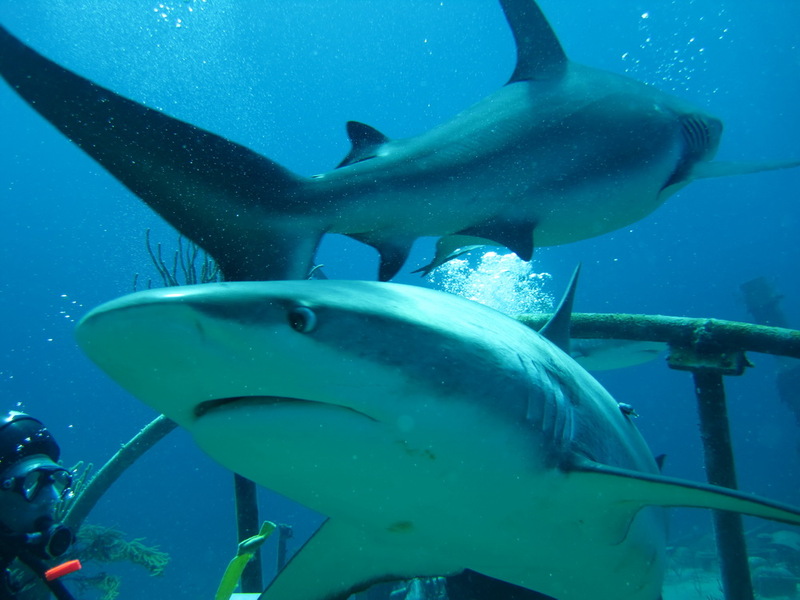 The Caribbean Reef Shark is most likely to be confused with the Dusky shark (Carcharhinus obscurus) and Galapagos shark (Carcharhinus galapagensis), but divers are unlikely to encounter either of those within the Bahamas. How dangerous is a Caribbean Reef shark? The ReefQuest Centre says that they're only two stars (out of 5) "According to the International Shark Attack File, 22 attacks are attributed to this species, of which 11 were provoked and none were fatal." And none of the attacks were on scuba divers. And although the sharks in the Bahamas were pretty big, one of my dive buddies picked up a small tooth that was knocked loose from the passing sharks (they lose teeth all the time; luckily, they have a robust tooth replacement mechanism). As you can see, it's not especially fearsome. Caribbean Reef shark tooth. The pointy end sticks up, while the broad base is anchored in their gums. 2. Speaking of kinds of sharks, one of the strangest sharks in the ocean today seems to be a holdover from the Cretaceous period. What kind of shark is that? Just from that description, can you figure out the genus and species? And I found a couple of possible candidates. Several articles in the first list of 10 hits all refer to Cow sharks, Goblin sharks, and Frilled sharks all as "living fossils." So I checked into each of these. Cow Sharks, (in the Hexanchiformes order) are considered the most primitive of all the sharks, as their skeletons resemble those of ancient extinct forms, with few modern adaptations. Cow sharks are represented in the fossil record by their characteristic cockscomb-shaped lower teeth, dating as far back as the early Jurassic Period, about 190 million-years ago. Articulated cow shark remains are known from the late Jurassic, about 150 million years ago (which means they didn't really arise during the Cretaceous, they were already around during the Cretaceous). On the other hand, the eel-like Frilled Shark (Chlamydoselachus anguineus) is probably about as old as the Cow sharks, but its unusual three-pronged, trident-shaped teeth are known only as far back as the late Cretaceous, about 95 million years ago. Still, there is some controversy about this, with some arguing that this shark is a relatively recent species, with the earliest known fossil teeth belonging to this species dating to the early Pleistocene epoch (only 2.5 million to 11K years ago). Goblin sharks, on the other hand dates back to the Aptian age of the Cretaceous period, and are strange, strange beasts. This is video of a Goblin shark swimming around in its normal swim posture. In any case, the Goblin shark, with it's very Alien-like, strange, extendable jaws, is clearly a Cretaceous fish. 3. While we're on the subject of large marine predators, I remember reading that there was an order of now-extinct marine reptiles that dominated the seas during late Triassic and the Jurassic periods. These giant predators were warm-blooded, and sometimes suffered from the problems of coming up too fast from the briny deep. What kind of animals were these? And how do we know they suffered from too rapid ascents? There are lots of hits there, but I wanted to find something fairly authoritative. That's when I spotted (at position 7 in the results list) the paper "Adaptations for marine habitat and the effect of Triassic and Jurassic predator pressure on development of decompression syndrome in ichthyosaurs." It caught my eye because it was from the journal Naturwissenschaften (2012 Jun; 99(6):443-8. doi: 10.1007/s00114-012-0918-0). This is very respected journal, and so I thought a paper published there would be fairly interesting. Decompression syndrome (caisson disease or the "the bends") resulting in avascular necrosis has been documented in mosasaurs, sauropterygians, ichthyosaurs, and turtles from the Middle Jurassic to Late Cretaceous, but it was unclear that this disease occurred as far back as the Triassic. We have examined a large Triassic sample of ichthyosaurs and compared it with an equally large post-Triassic sample. Avascular necrosis was observed in over 15% of Late Middle Jurassic to Cretaceous ichthyosaurs with the highest occurrence (18%) in the Early Cretaceous, but was rare or absent in geologically older specimens. Triassic reptiles that dive were either physiologically protected, or rapid changes of their position in the water column rare and insignificant enough to prevent being recorded in the skeleton. Emergency surfacing due to a threat from an underwater predator may be the most important cause of avascular necrosis for air-breathing divers, with relative frequency of such events documented in the skeleton. Diving in the Triassic appears to have been a "leisurely" behavior until the evolution of large predators in the Late Jurassic that forced sudden depth alterations contributed to a higher occurrence of bends. In other words, marine dinosaurs (the mosasaurs and friends) got the bends back in the mid-Jurassic until the late Cretaceous. Oddly, similar diving animals in Triassic (which was earlier, before the Jurassic and Cretaceous) didn't have this. The authors think this is because that's when bigger and badder predators evolved, forcing these later marine animals into "emergency surfacing" (that is, coming up too fast and developing the bends). Now, I hear you asking, "I don't know what this Naturwissenschaften thing is... Why should I believe you when you say it's authoritative?" One easy way to check for the acceptance of a journal like Naturwissenschaften is to do an advanced search with Scholar. You can quickly scan the articles and check things like "how long have they been publishing?" and "do other authors cite work published in Naturwissenschaften?" And the results. Note that there are around 97,000 papers published, and the top several papers have MANY MANY citations. These are the hallmarks of well-respected journals--longevity, citations by others, authors from established institutions, and so on. If you check the Wikipedia article about Naturwissenschaften, you'll find that they've been publishing since 1913. The original subtitle was Wochenschrift für die Fortschritte der Naturwissenschaften, der Medizin und der Technik (Weekly Publication of the Advances in the Natural Sciences, Medicine and Technology), and is now published completely in English, having changed over from German in the 1990s. As some Regular Readers noted, there is some controversy about this finding. But that's what makes it interesting science. The observation that there's a big change over time leads one to suspect an underlying cause. Pity we didn't have a camera there to document the chase! 4. If you're really into the topic, for extra credit, in the picture above why does this shark's eye seem to have a white crescent moon in it? (No, it's not a cataract, nor is he bug-eyed.) It's a normal sharky thing. But what's that white thing called? 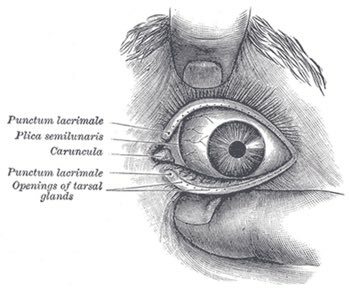 and found a fascinating article on their Nictitating membrane. This is a transparent (often just translucent) membrane that covers the eye of fish, amphibians, reptiles, birds and mammals. This membrane protects the eye when the eye is potentially exposed to a hostile environment--in the shark's case often when they're about to strike a prey (which might flop around in protest, potentially striking their eye). From the description, this is pretty clearly the Caribbean Reef shark's nictitating membrane. What do you know--I do have something vestigially in common with the sharks! 1. Use whatever text you've got! As in many of the Challenges, starting with the text you can see will often get you a long way. In this case, we found the dive operator, and then a place, and a strong suggestion about what kind of sharks these are. 2. Verify what you've read. We know it's tough to positively identify animals, but in this case we had a strong lead ("Caribbean Reef shark"), and then turned to identification guides to get to a positive ID. I checked a couple of different identification sources AND looked at the images of possible confusingly similar sharks until I knew I could spot the differences. 3. Check the dates. The Cow, Frilled, and Goblin sharks are all "living fossils," in one form or another, but they didn't all come into being in the Cretaceous AND stay more-or-less the same until now. Details matter in these Challenges! 4. Sometimes you need to find the right technical term to get started. In this case, we had to search for a specific term (or phrase) for "coming up too fast from bottom of the ocean..." and we learned about "the bends" and "DCS." Once you've got those terms, the rest of the search is easy. 5. Check authoritativeness. In this example I showed you how to use Scholar to identify the credibility of a publication that you might not know. Obviously, there's more to authoritativeness than just this, but this is a method you might not have thought about. Great comments for this week's Challenge. Well done, troops! 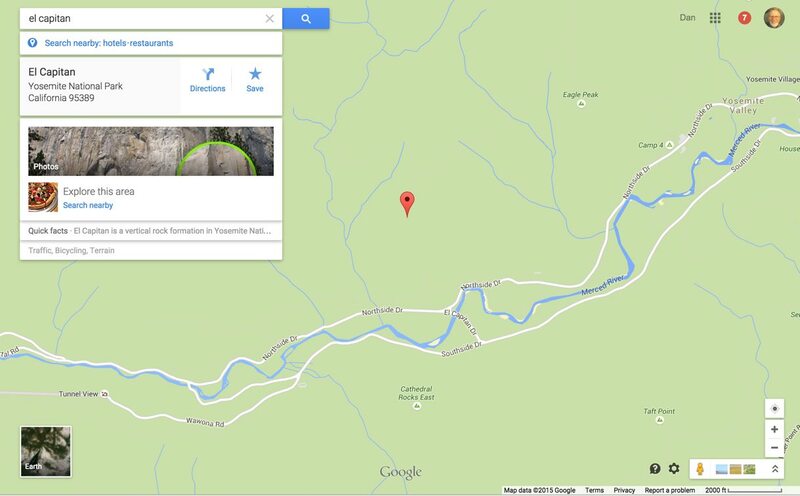 I hope you saw the recent announcement about the newest Streetview images. A few crazy people climbed El Capitan... WITH all of the gear for taking Photospheres (Google's 360 spherical zoomable/pannable images). 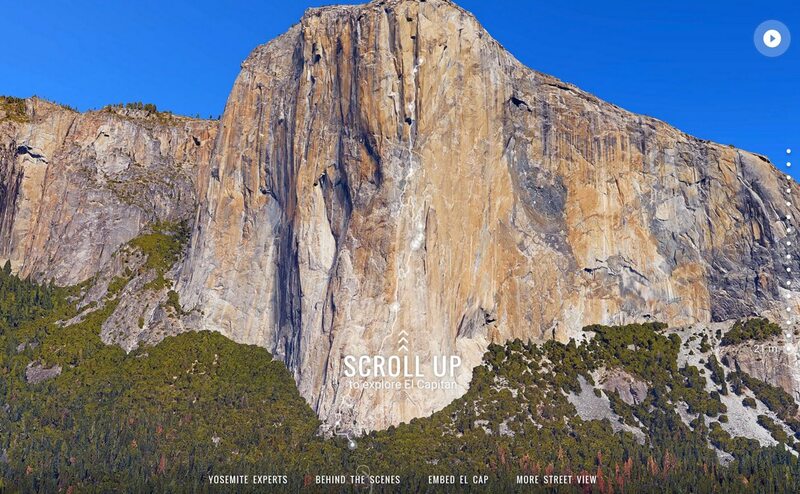 I thought I'd point it out to you if you didn't see it, and show you the one weird trick you need to know to find more Photosphere and panorama images. 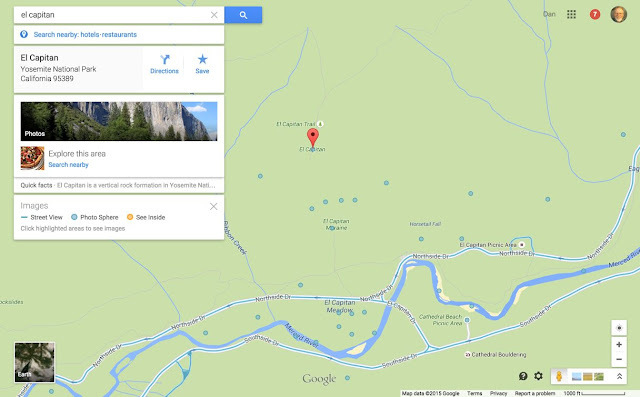 If you do a search for El Capitan in Yosemite National Park, you'll find this. As you know, you can click on the yellow Pegman icon to highlight all of the places in the map that are "Streetview-able" -- they get highlighted in blue. And it also shows up as a bunch of blue dots on the map. Pro tip: If you're NOT zoomed in close enough, then the blue dots of Photospheres and panoramas won't show up on the map. Give it a try, and if you don't see them, zoom in a bit and click the Pegman again. 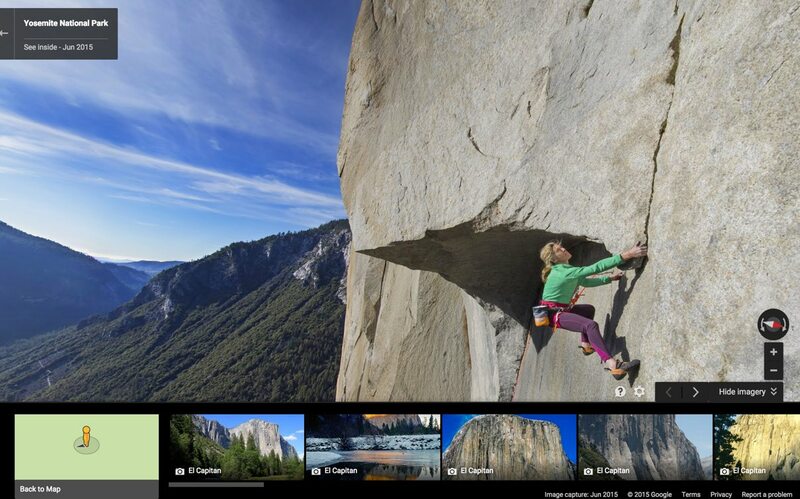 Once you do this, you'll be able to click on a Photosphere and share in the experience of the climb with Lynn Hill (the woman pictured below). It really is a great set of classic high wall images. That you can zoom and pan around along the route of the climb is really marvelous. Check it out! ... being a curious sort of fellow, I sometimes find fairly remarkable things. And being a SearchResearcher, I wonder about these things I find. Not long ago a friend of mine took this photo of me on a dive, hanging onto the rail of a wreck at 50 feet. As you can see by my terrified expression, I'm not especially worried about this guy (even though it's somewhat larger than I am). I did a bit of research about these sharks (before I got into the water, I should add) so I knew what to expect. Along the way, I learned a few additional things about other kinds of fish that I want to pose as Search Challenges. As always, be sure to tell us HOW you found out the answer to the Challenge. We all want to learn from your brilliant search behavior! the search challenges easy (but interesting), and difficult (but challenging/fun in a different way). Luckily, everyone seemed to enjoy this Challenge. There certainly was a bunch of discussion about it! 1. What fountain is this? Where is it located? And who was the sculptor? 2. Can you identify the other, more famous statue by this sculptor, and tell me what color was it when it was made? 3. Can you find any other copies of this other, more famous statue? Where are they located? 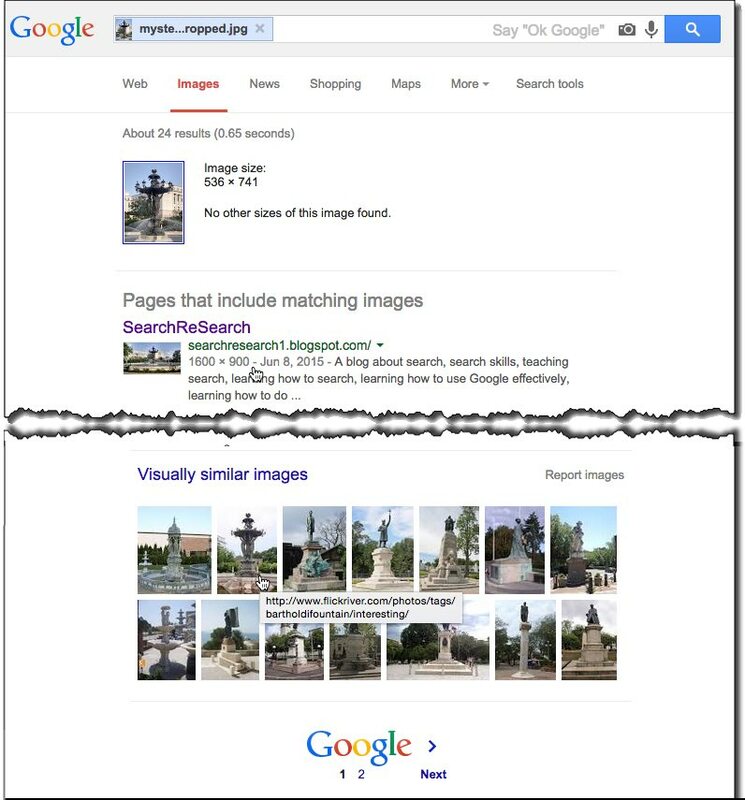 Look at the popup on the hover (next to the hand cursor--second image from the left, first row of "visually similar images"). 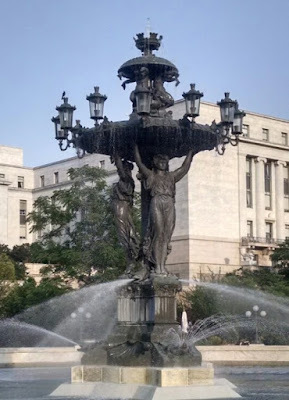 If you click on that image, you'll find the fountain identified as the Bartholdi Fountain. 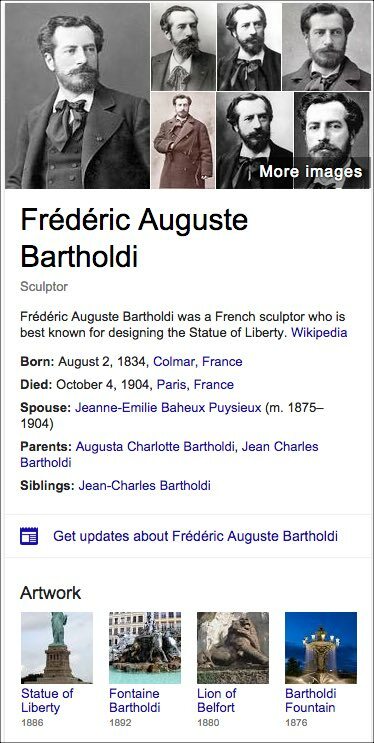 A quick check on that name leads to a very nice Knowledge Panel that confirms this was created by Frédéric Auguste Bartholdi. Oh, btw, the Google Map also tells you where it is, rather close to the Capitol building. By the way, this also points out some of his other works--the Lion of Belfort, and the very famous Statue of Liberty. and quickly found several articles that pointed out the statue's skin is made of copper, which is why it is NOW a green (aka verdigris) color. 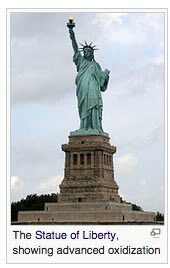 Interestingly, the example of great verdigris as given in the Wikipedia article is the Statue of Liberty. So, obviously, the Statue of Liberty was originally copper-colored. Any other copies of the Statue of Liberty? I originally started to answer this by looking up other copies that I knew about (e.g., the one in Las Vegas, and I knew there was one in Paris). I was surprised, though, when I looked it up to learn there are TWO copies in Paris. took me to Wikimapia, which shows the two in Paris. The comments there point out a THIRD in Paris at Musée des Arts et Métiers. It's a simple search tactic, but one well worth remembering. 1. 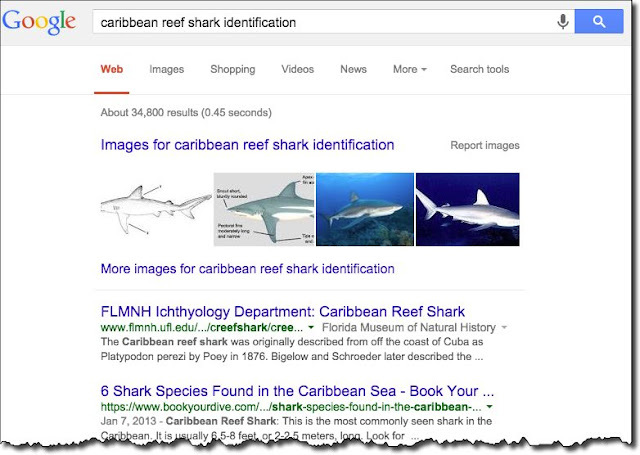 When you're searching for a complete list of things, try searching for the list of things. I know this sounds dumb and obvious, but it took me a few minutes to remember this. This is especially true when you're looking for all of the instances of a kind of thing... and you don't think such a list would exist. Possibly my favorite "unexpected list" is this list of octopus species. Really? Yes, Wikipedia never ceases to amaze. 2. Remember to crop the image down to just the most salient bit. The Search-By-Image algorithm works best when it's matching just the part that you care about. Or, to put it another way, the part that many other people have already photographed. In this case, since the background is so variable (depending on camera angle), cropping to JUST the fountain is a great trick to remember. 3. Check the Knowledge Panels for relevant information. 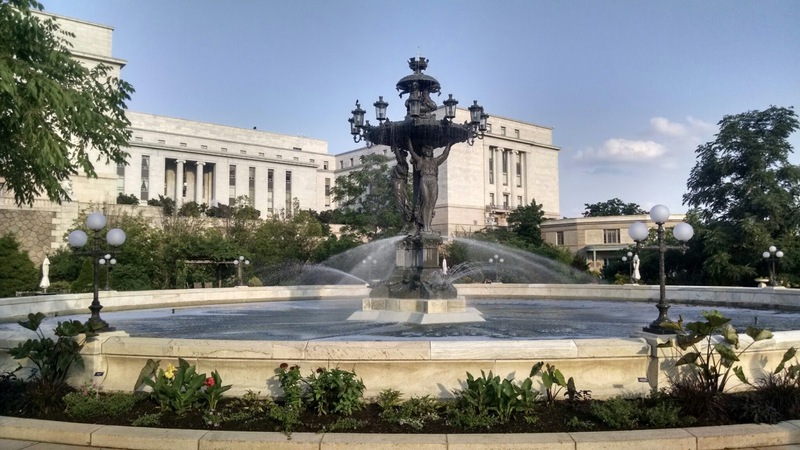 They're constructed with a collection of commonly-requested facts about the entity in question (in this case, either the Bartholdi Fountain, or Bartholdi himself). Thanks for searching. Our next Challenge will be on Wednesday of this week! Search Challenge (6/17/15): Fountain's Famous Cousin? I took a picture of a lovely fountain that I happened to find while on a run somewhere on the east coast of the US. As I ran around it, this struck me as being very similar to other sculptural works I'd seen. So I checked it out and found that the sculptor of this fountain was also the sculptor of a much more famous work--a cousin (so to speak) of this work. After last week's somewhat challenging Challenge, I thought we should have some fun with this one. As always, I'll come back (next week on Monday) to chat about what the Regular Readers found, and how I solved the Challenge. In your comments, please let us know HOW you figured this Challenge out (and if you can, tell us about how long it took for you to solve it). WHEN I wrote the "Art History" Challenge, I didn't think it would be quite so interestingly complex. As I was writing, I thought maybe it would take a few minutes to resolve, and it would be one of the easier / more-fun Challenges. I didn't realize that this would open a whole can of worms! Let's work through each of them one at a time. 1. Gentle SearchResearcher--what IS a "pony ballet" in the context of Glackens' time? As you can see in the lower left corner, the men of Littleton, NH dressed up as ballerinas, and give one sense of "pony ballet." (That is, men performing as cross-dressed ballerinas - a men's "pony ballet.") If you do a search for [ "pony ballet" men ] you'll find all kinds of male dance troupes that are called "pony ballets." Here's a lovely example from Columbia University, 1929, in a performance of "Oh Hector." From Columbia College Today (1929). But Glackens' painting of 1910 is clearly of a woman (or is the disguise THAT good?). So, what gives? which led me to a book about American Musical Theatre: A Chronicle. (2010, Oxford University Press) This seems like a great reference work (the reviews of the book are very positive, it's from a well-known university press, and is extensive--see the table-of-contents). In that book appears the line (p 221) "The show's pony ballet .... heightened the vogue for the diminutive chorines." Another hit a bit farther down the SERP leads to the original cast for "Mr. Bluebeard," listing Elizabeth Hauman, Lonie Hauman, Beatrice Liddell, Eva Marlow, Dorothy Marlowe, Seppie McNeil, and Carolyn Poltz as "the pony ballet." 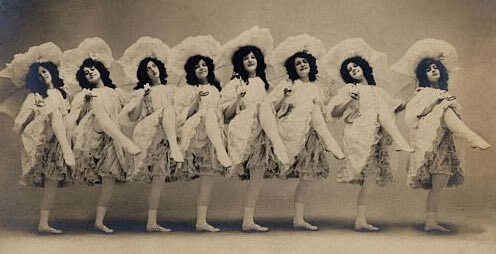 The eight little dancing girls who compose the English Pony ballet of Piff, Paff, Pouf, live on the community plan. Miss Beatrice Liddell, of their number, acts as financial manager for the Ponies. Their salaries go into one fund, and at the end of the week the unused balance (and it is usually a pretty good sum) is sent to a certain London bank. The Ponies realize that they cannot always be pretty and supple, and are preparing for that time while the sun shines. 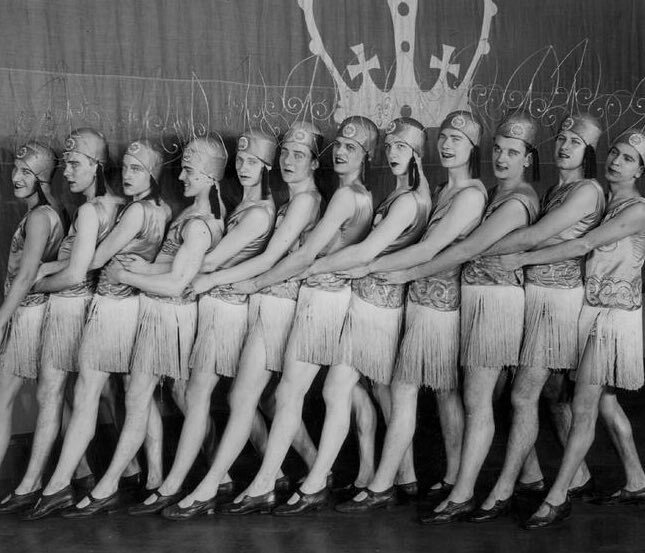 I will remain quiet about the wisdom of them dancing in costumes covered in radioactive "radium paint"... "while the sun shines..."
Another query for [ pony ballet girls ] shows even more young/small chorus girls as members of the pony ballet. That's pretty convincing. Around the time Glackens was painting, pony ballet dancers were either "small chorus dancers" OR "men cross-dressing as ballet dancers." 2. How many completed paintings did Renoir create in his lifetime? Such a simple question, such a complex answer. But I have to admit, this is the kind of thing I should have anticipated. Whenever you have a definitive question (that is, one that you think would have a simple, single answer), you HAVE to think ahead of time about whether or not the value is clearly defined. But be careful: that scrolling list of images across the top is NOT the complete list of all Renoir paintings! Note that it doesn't actually say that it is... you have to be careful that the search results might not be exactly what you asked for. I looked at the 3rd hit here ("Complete list of Pierre Auguste Renoir's oil paintings") and found there were 940 paintings listed there (with thumbnail images for each--I figured that by copying out the entire text of the page, pasting it into a text file, then counting the number of lines by using a text editor). 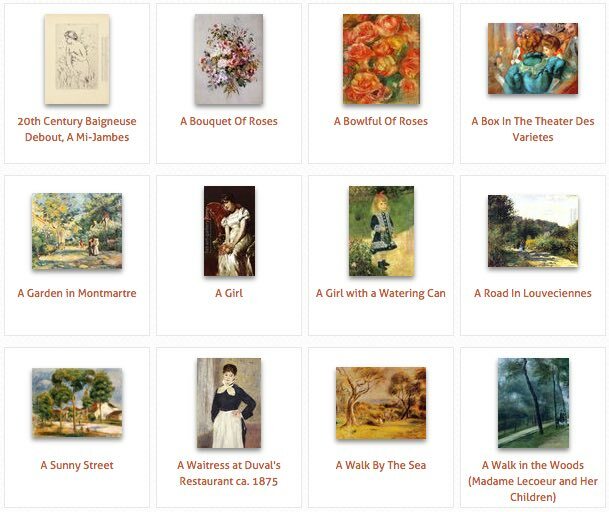 A partial list from a poster company that claims this is top of the "Complete List of Renoir's oil paintings"
This approach wasn't working for me. There are lots of documents claiming to have a "Complete list" of all the Renoir paintings, but many of them are missleading (e.g., this book whose title is "Delphi Complete Works of Pierre-Auguste Renoir (Illustrated) (Masters of Art Book 11)" but whose author is Pierra-Auguste Renoir! When you look at the book, it's obviously a shortened list of the real works. Disappointing. This also gives a number of decent sites, many with "number of paintings" in their texts. UNFORTUNATELY, these sites disagree in the number of paintings they believe he did. The web museum site http://www.pierre-auguste-renoir.org/ lists the number at 1736. The Wikipedia entry on Renoir in giving an overview of his work gives us the first hint of a problem--not only are there oil paintings AND prints AND porcelain sketches, but the article says "several thousand." In the Yahoo QA article, the answer is given as "more than 4000 paintings" with a dead link (even the Wayback Machine didn't have it). In yet another Yahoo QA page, the answer is "about 6000 paintings." 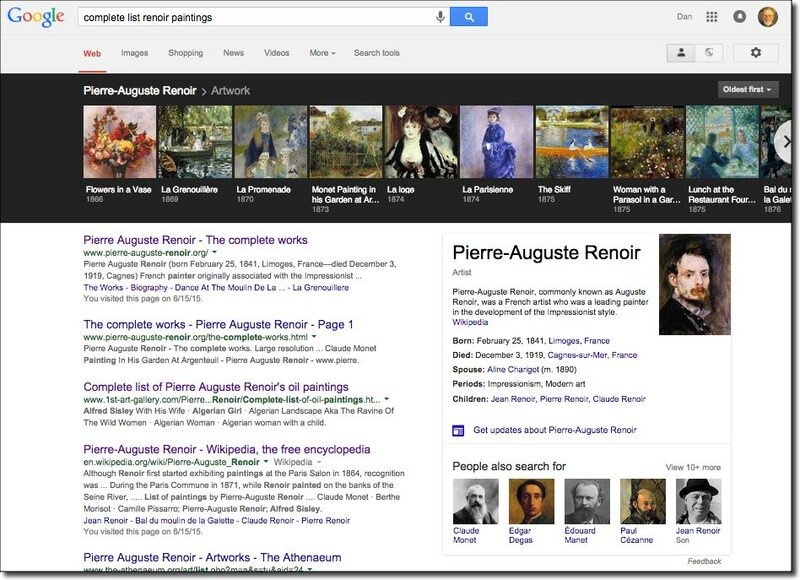 So, all we have to do is find the catalogue raisonné for Renoir. The first hit is for the Bernheim-Jeune catalouge raisonné (there are several), and looking at the description of the book we find the phrase "... we identified and reproduced 4019 paintings,148 pastels, 382 drawings and 105 watercolors for a total of 4654 works listed and reproduced." But as Rosemary pointed out in the comments, it's somewhat unclear if all of the results are authentic--could some be fakes? As with many famous (and expensive) art/artists, the works can be sometimes seen as... suspect. Jon-the-Unknown also brought up the issue that the Wildenstein catalouge might be incomplete, AND that Renoir might have created other works that he gave other signatures, encrypting his own signature. But this is currently speculative.. and maybe a future SearchChallenge. Note that I used OR to synonymize "chocolate" with "chocolat" since I don't know whether or not the picture will be titled in English or French. There are lots of hits, but only 3 different images show up, these three right here. That wasn't too difficult... but I'm not sure how complete it is. I checked the other lists available online (e.g., the list of 940 from above), and found these 3 works. But until the masterlist of the catalouge appears online, this will have to do. 4. Given his paintings, how long did Henri Rousseau live in a jungle landscape? took me to the Wikipedia article which has the surprising line "..even though he never left France or saw a jungle. Stories spread by admirers that his army service included the French expeditionary force to Mexico are unfounded." Well, THAT's interesting. But I thought I should look for another biography or two to make sure that he didn't slip in a half-year in Tahiti, or something similar. So the Wikipedia story seems to be correct: Despite his tendency to paint wild jungle scenes, Rousseau didn't ever actually live in a jungley landscape. It was all out of his imagination (and a few visits to French greenhouses)! * Even simple and obvious questions might turn out to be quite complex. This was certainly the case with the "how many paintings?" question. There were a number of different answers, and given the ambiguity in the question, it's not a surprise. When answering questions like this, be sure to get clarity on what you're seeking! * Pay attention: You'll learn useful things. Before starting this search, I didn't know what a Catalogue raisonné was--now I do. Even though it was painful to find an online version (and, as we learned, somewhat controversial), it's still a useful concept to know. * Use one result to bridge to the next. 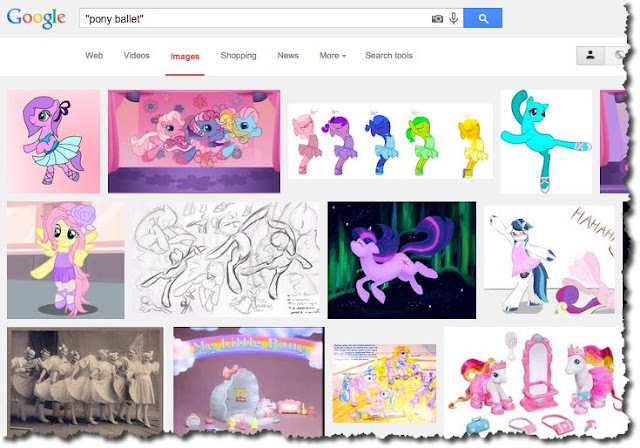 I did a single search to find a photo of the "English pony ballet in Mr. Bluebeard...". Using the title of that photo, I was able to find books on the topic. Take what you find in place X, and leverage that phrase (or unusual name) to find more on the topic. And... of course, the biggest lesson: These simple questions can have more depth than you might expect. Answer: Why so ... young?